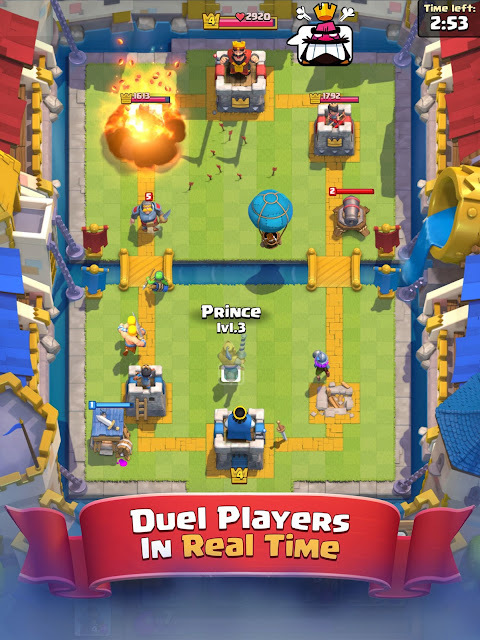 Clash Royale is the latest game from Supercell (known for Clash of Clans and Boom Beach) which is another free-to-play game for mobile (both iOS and Android). Unlike the prior games, nothing takes place while you are away except countdown timers for chests which I will explain in a bit. In Clash Royale, you build a deck of 8 cards and with each card, there is an elixir cost associated to them, I believe from 2 elixir to 9 elixir, which you will use take down your opponents in a one-on-one battle. Once you have your deck selected, which you can have a few pre-set, you go into battle with a random opponent who is usually around your level. The game is split into two battlefields, the bottom half is yours, the top half is your opponent's. Each person has two side towers and one crown tower in the middle. Once the crown tower falls, you have lost. 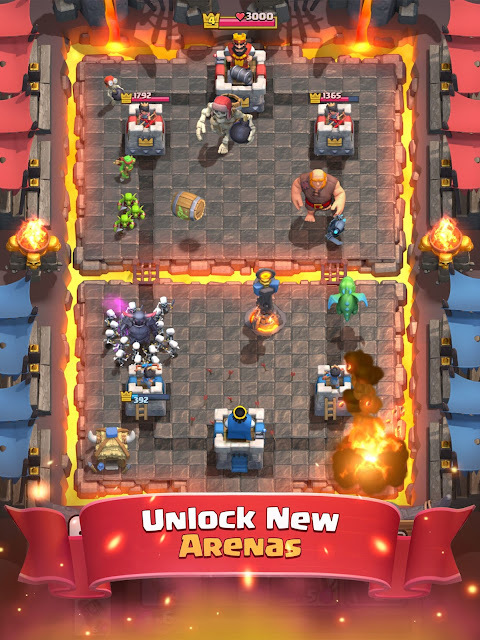 At the beginning, you can only place cards on your half of the board and when you defeat enemy towers, you gain a piece of their land where you can put down your cards on their half of the board which means you can approach them quicker. The games are quick because each battle has a 3 minute timer, with a 1 minute sudden death in case of a tie. At the bottom, there is an elixir bar which gets filled with time and you can hold a maximum of 10 elixir. The rate of refill is the same for both players. Card use is simple, you just drag and drop your card if you have enough elixir and it will appear and do what it does automatically. What it does depends on what the card is, some are buildings that are defensive which attack nearby enemies, buildings that periodically generate units, units that rush enemies, among other card types. 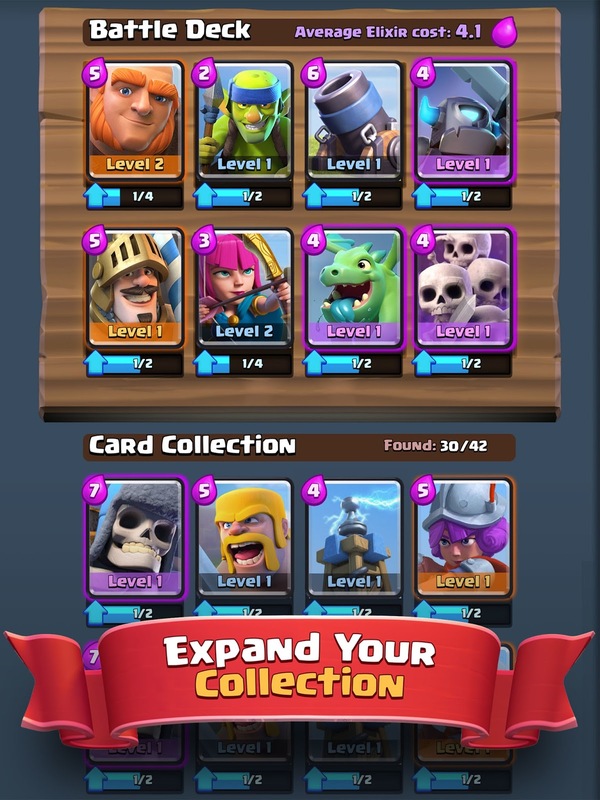 So, there is a lot to the deck building, and you need to make sure that you have a deck that works well for you and is able to counter what the opponent will have. When you win or lose, you gain/lose trophies which are used to determine what overall level you are at which unlocks new arenas and cards that you can get. Now, once you win, you get a chest, and these come in different sizes and depending on the size, you have to wait a certain period of time for them to unlock. 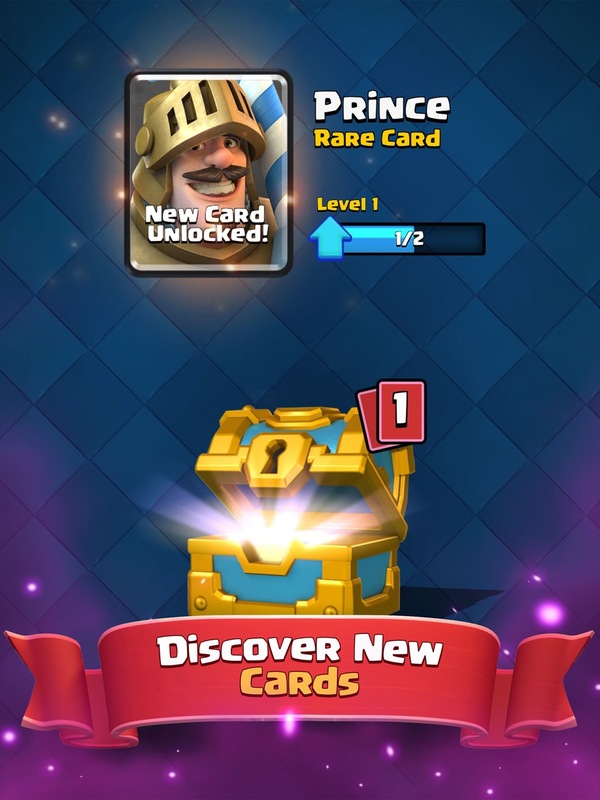 You can only hold 4 chests at any given time, however, you can speed up the unlock time by paying gems to unlock them, which is one of the game's currencies that you can pay for. Otherwise the wait time starts from 3 hours and I believe goes up to 24 hours which is a very very long time. 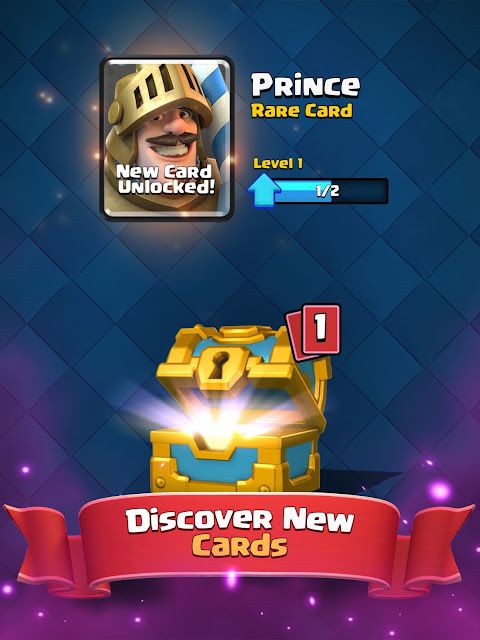 The chests will always contain some gold, the game's other currency, and some cards. When you get cards, you will either get new cards that allow you to use something new, or you get old ones, which allow you to level up your existing cards. How does that happen? Well, each card has a level, to get to the next level, you will need a predetermined amount of the card as well as enough gold to level them up. This means that even though you can your opponent have the same card, it is possible that one is weaker than the other. So, even if you constantly get common cards, they can get very powerful due to leveling them up. Also, there is a component where you form a clan and this is an important part of the game. You need an active group and it currently holds a maximum of 50 players. Within the clan, you can solicit card donations which means that you can level up your cards quicker. You can also donate cards, which gives you experience and gold back as well as giving away cards that you won't use anyways. As you can see, being in an active clan, you can progress quicker than without a clan. It sounds like a lot to take in, but it is really easy to get into, but hard to master. I had a lot of fun for around a week, but the constant grind after made me give up since I felt like I was not getting anywhere. Also, I found that most people were playing with the same or similar decks and it made it quite boring when I knew that I would win against certain decks and lose to certain decks. I enjoyed it for the short period of time that I played it. I feel that it has a good foundation and a lot of people really enjoy the game, so give it a shot and see how you like it, and maybe you will be more addicted than I was. I do find that I have a short attention span for a lot of the free-to-play games I play on mobile and this was no exception. Come back next Wednesday for my Final Thoughts on Hitman Go for Android.